There's a Koru sculpture in the small rose garden where my Rhapsody in Blue roses grow. 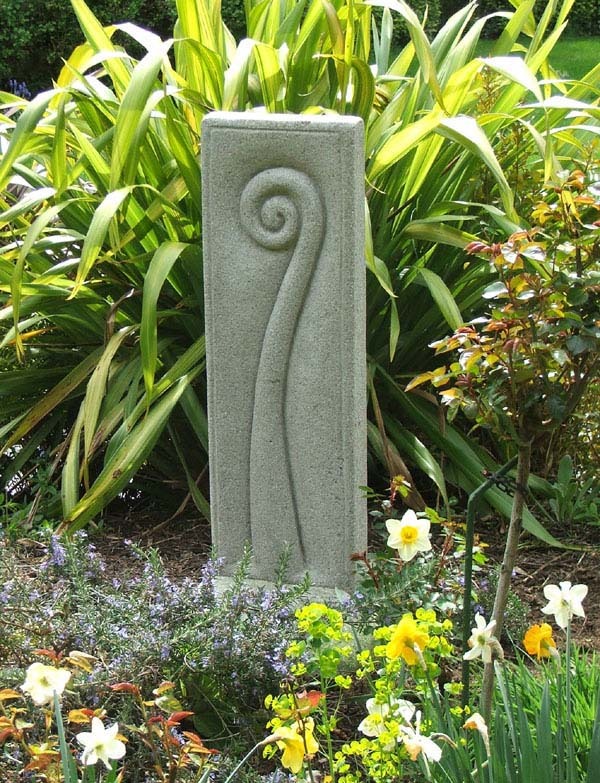 The Koru is a strong New Zealand form, spiritual and peaceful, a symbol of life's growth. 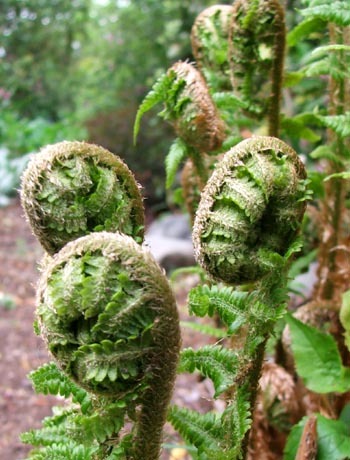 The Koru pattern represents the fern frond opening. This gentle spiral shape fits the setting perfectly. 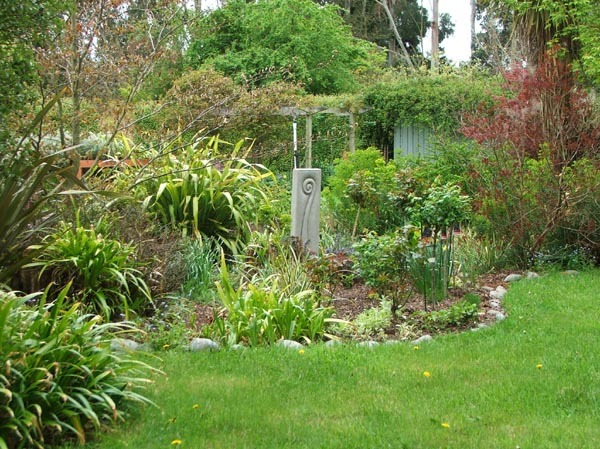 Real life tends to travel a curved, looping path - as does life in the garden. In fact, the seasons are almost circular - the same weeds pop up like a spring plague, the same summer winds puff and blow down the Delphiniums... All part of the circle of life in the garden! My Rhapsody in Blue rose garden was created in memory of niece Rachael. It's planted simply, with blue, yellow, and cream flowers, and standard Rhapsody in Blue roses along the lawn's edge. There are yellow summer daylilies and spring daffodils. A yellow flowering Hypericum shrub glows in the mid-summer sun. New Zealand flaxes, deep purple and bright green, fill the back by the water, giving all-year colour. Real ferns grow by the water's edge, their fronds slowly unfurling in the middle of spring. The water burbles by, and the flax leaves shine and sway in the sunshine. It's a wonderful place to stop by and reflect. The stone Koru stands strong in the middle, a silent sentinel, embraced by Rosemary shrubs. Rosemary - that's for remembrance. I know Rachael would have loved it.